**Update April 26, 2011 -- Rain!!! This sandy hill had an inch and a half of thundering rain captured in the rain gauge last night, and this morning I did hear frogs croaking. While they aren't there in our shriveled up pond in great numbers as in bygone days, enough are there you can hear their song. The grass is miraculously greener today as well, and the cows are cleaner and much much happier, and so am I!! Good Friday and Easter Sunday.....close your eyes and think of the first things that come to mind, reminisce about Easter's past, and not once will you recall hot, dry and dusty weather and wildfires -- at least not if most of those Easter's past were spent in Southeast Texas. It is so dry, so windy here that it is just plain scary. We had a couple of days last week where the smell of wood smoke was so strong you just knew there was a fire close by that was headed out of control. Turned out it was a fire pretty far south in the northern part of Hardin County, a whopping big 7000 acre fire being fanned by crazy winds. The days the smell of the smoke reached all the way to this far northern tip of Tyler County were windy days indeed, and the direction of those winds sent the odor lingering in those enormous clouds of smoke right to our front doors. The pastures are bone dry, and disturbing the soil sends up swirls of white sand carried off by the winds. The grass is dead and dying and today we started putting out hay again for the biggest part of the herd. The poor cows desperately need a rain bath to clean up their pretty white fur, and at this rate the little ones will be months old before they even know what rain feels or sounds like. Okay, I've depressed myself enough putting down in words how very very dry it is, and it could be that negative thinking might just perpetuate this worst nightmare Spring weather. To counter that negativity, I found a youtube video of great rain sounds-- if you miss the sound of rain, listen up. Maybe if we all think of rain together -- imagine the sounds from childhood of it falling and tapping on a tin roof, or conjure that sure sweet smell of a big rain coming when the air holds still and the sky is blackened, hear the mighty crashes of thunder, feel the chill down your spine when suddenly a breath of breeze moves across your skin that has a bite of coolness and a feel of newness. Rain, the life blood of all that is new and fresh again when the season of Spring rolls around. Okay, I'm opening up my eyes again . . . yeah, I do feel more hopeful that it will surely rain again . . . some day! I imagine the frogs are hopeful, or have they headed for the nearest river by now? There have been some spring nights here in the years past when the sound of frogs was like an entity of its own, an organism, a giant UCO (Unidentified Croaking Object). I'd really like to hear the sound of frogs after a rain, you have to wonder just what happens to the poor frogs without the rain? 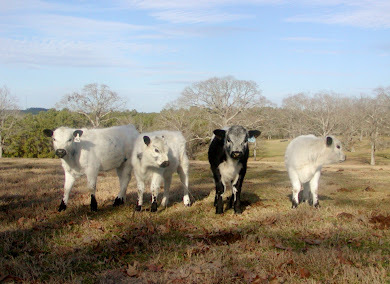 ﻿﻿﻿﻿In late March my herd of British White cattle received international visitors from the Netherlands. All my girls behaved themselves and much enjoyed being admired. A lovely young Dutch couple honeymooning in Texas made the ranch an afternoon stop on their exploration of our fine state. A couple of weeks prior I received an email from Mieke, inquiring if she and her soon to be husband Peter, might visit the ranch. 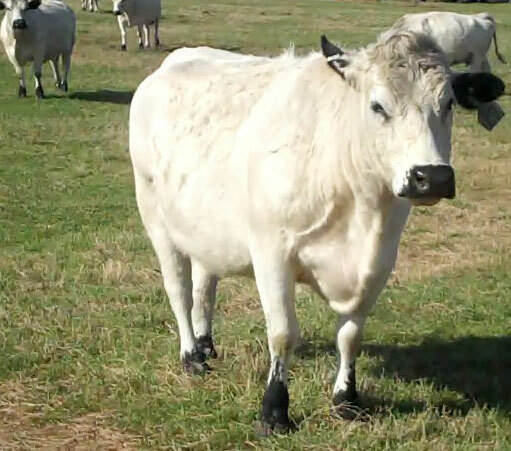 Of course, I was quite delighted to say yes and found it a very nice compliment to my British White herd and my efforts to promote the breed via the internet. Mieke and Peter make their home in the far south of the Netherlands in the province of North Brabant which borders the country of Belgium. The municipality their village lies within is Sint-Michielsgestel, and it was curious to learn that Gestel means high, dry, sandy land -- which is a pretty apt description of the land of this ranch as well. Fortunately, when the newlyweds visited the grass was green and the scent of clover was in the air -- now, barely two weeks later, that is long gone and we are super dry and hot and the sand is blowing to the next county with strong winds. 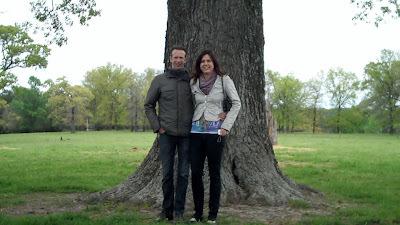 Peter and Mieke standing by the "Wedding Tree"
Mieke is an Event Planner, this is a field of university study that I was unfamiliar with, but have since learned is a growing field here in the USA as well. Mieke put her organizational skills to good work in planning their honeymoon, and Peter was more than happy to oblige that schedule behind the wheel as they drove across the state of Texas and even as far north as Oklahoma City. 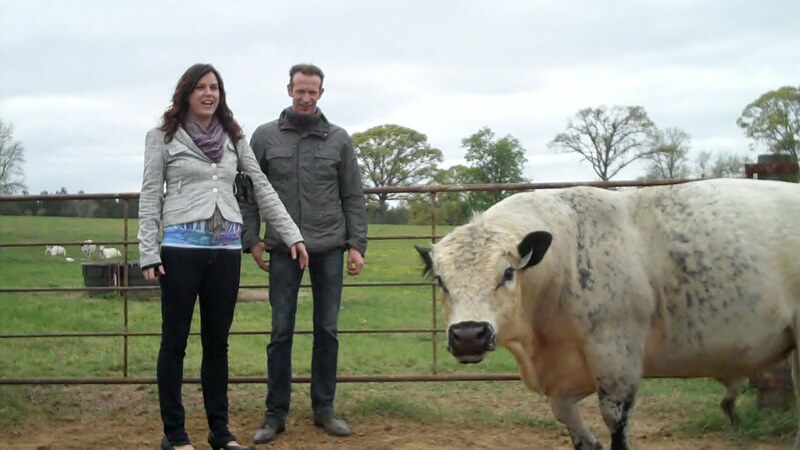 Peter is a cattle trader in the Netherlands, and Mieke arranged their travels in Texas around visiting ranches and seeing cattle, and that is a mighty nice thing for such an elegant young lady to do for her new husband. 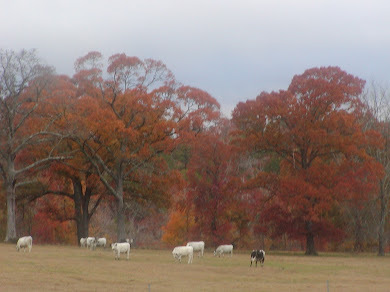 Mieke and Peter covered a lot of territory -- from a private tour of the King Ranch to the far south of Texas, to all the way north to the Oklahoma Stockyards to attend that renowned cattle auction. ﻿﻿ Cattle auctions are no longer held in the Netherlands due to foot and mouth disease concerns. More recently, the cattle population has been threatened with Blue Tongue disease -- and the tight controls already implemented, as well as a comprehensive vaccination program, is hoped to have the Netherlands officially Blue Tongue free this year, as no cases have been found since 2009. Blue Tongue is hurtful to any catttle operation, but for a dairy focused on milk production, the significant drop in milk production of an infected cow hits their bottom line, whether they eventually lose the cow to the disease or not. See this UK Telegraph article for an excellent word picture of the state of Germany in 2007 at the onset of the Blue Tongue outbreak in Europe, and this UK Telegraph article: Blue Tongue disease: A Killer in the Countryside. Rather than have a mixing of cattle from various herds at auction, cattlemen such as Peter go to each dairy farm to negotiate their purchases, and the calves are transported directly to the facility Peter operates. 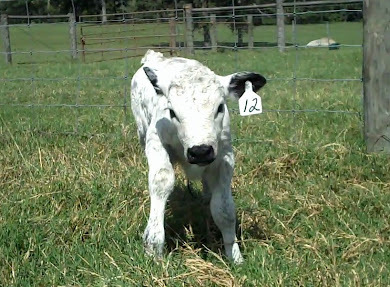 This type of approach to cattle buying and handling goes a long way to assist with locating from what particular herd any disease originates, but does hamper the normal fixing of market price from a gathering of buyers and sellers at an auction. The dairy business quite famously dominates the cattle industry in the Netherlands, and the calves raised for beef originate with dairy herds. 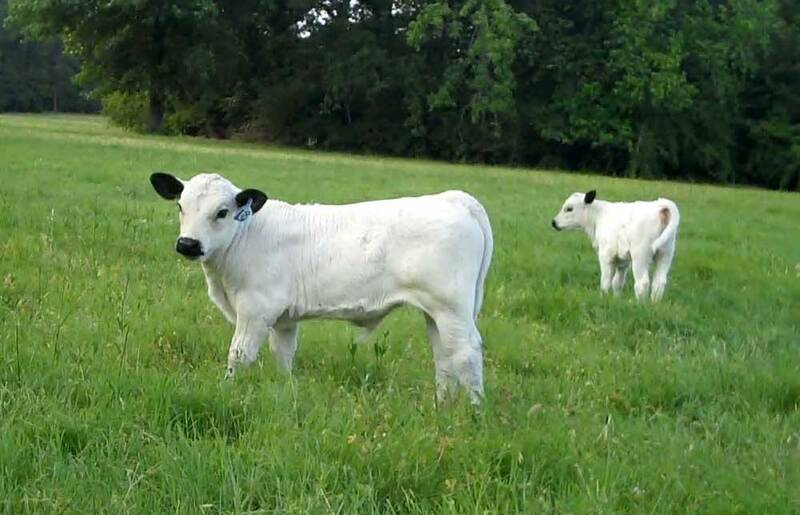 The quite valuable dairy heifers are retained, but the bull calves at about two weeks old are removed from their dams and sold to cattlemen such as Peter for predominantly veal production. Elvis coming up to say hello to the Newlyweds . . .
Mieke directed me to the web site of the Dutch-owned VanDrie Group, which is actually the largest producer of veal in the world, and VanDrie's web site demonstrates through many photos the types of calves Peter buys and the feeding process and housing facilities that are commonly used to rear the young bull calves. 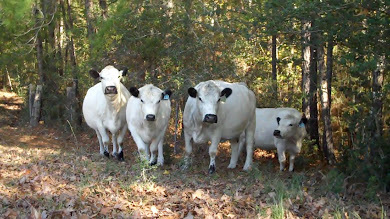 When we started our walk among my British White cows, the first group we looked at were the heavy bred cows by the house. Immediately Peter was struck by how quiet they all were. It was early afternoon and they were mostly lying around and Peter was able to walk up to them with ease -- and "easy" was the comment Peter made, that they were very "easy" cows. 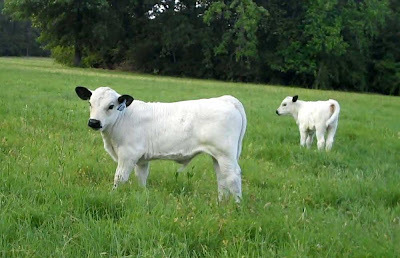 That very simple and succinct first impression of the breed will always stay with me, as it really does fully express the British White breed -- they are easy in most every way. As we walked around different pastures I took some video of Mieke and Peter and it is presented below. I hope you enjoy watching it, and I send my best wishes to this smiling young couple for a long and happy life. 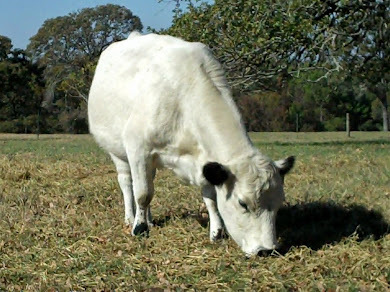 Vast amounts of money and time have been spent, and continues to be spent, in researching the nutritional benefits of grass fed beef, a 'natural' beef product; as well as researching the various beef fattening qualities of assorted grains and industrial byproducts for the modern day 'traditional' approach to both rearing and fattening cattle. 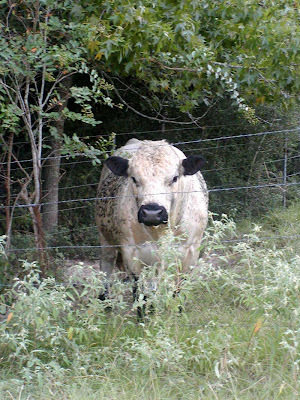 A look back in time to the agricultural conversation of the middle 1800's in Britain reflects, in its very essence, the same agricultural conversations found in the United States today in mainstream beef fattening research and practice. The singular difference in those 'conversations' is the clear recognition that a grass fattened beef animal in the middle 1800's was a fond memory -- yet still considered the optimal eating experience. 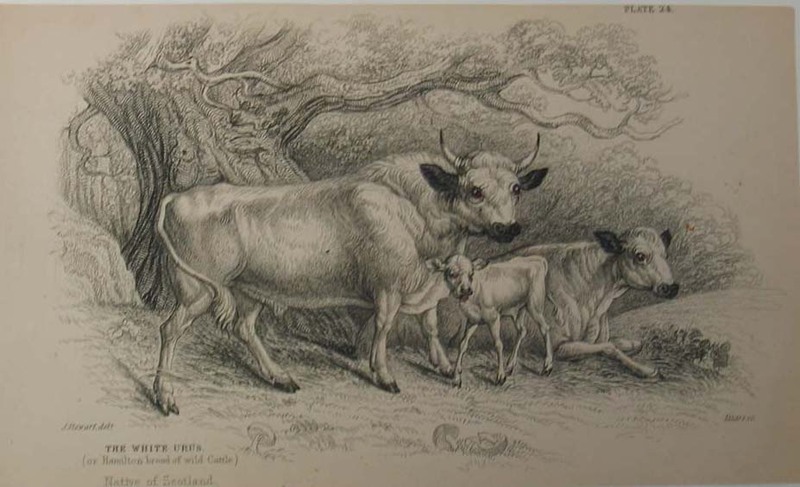 Population growth and demand for beef, coupled with vastly improved agricultural practices in the large scale growth of vegetables, made this preferred grass fattened carcass impractical as arable land was converted to crops. 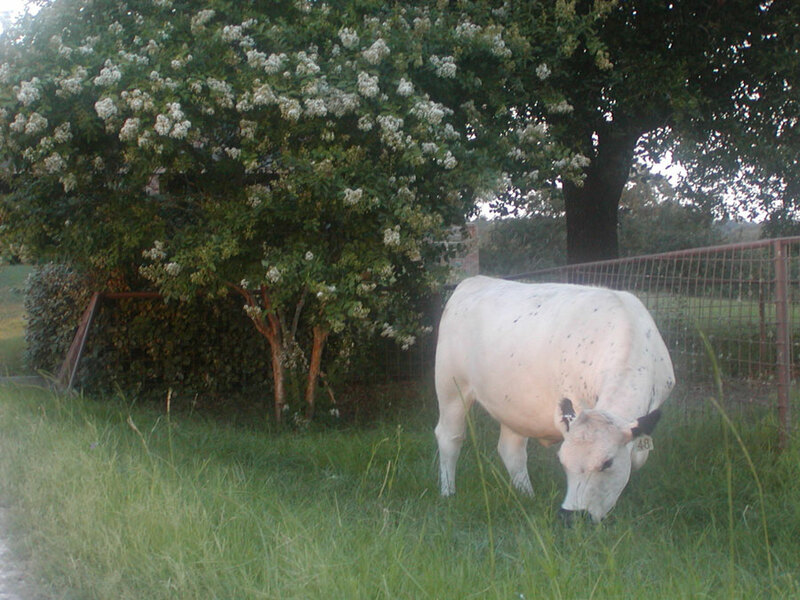 The first major change in supplementation of the beef animal's diet was in the use of what was termed 'oil-cake'. Oil-cakes in their early use were primarily a residual product of linseed. The oil of the linseed was expressed from the seed and the remainder was referred to as oil-cake. This is much like the dependence today among many small beef cattle farmers on a ready supply of salted cottonseed meal. The product is generally salted to varying degrees to control consumption, and allows it to be provided 'free-choice' to cattle herds. In the mid-1800's, farmers had already begun to experiment with various vegetables and by-products for use in fattening cattle. Today's use of brewer's yeast in the fattening of cattle seems one that is novel when you look at the mountains of research aimed at clarifying and promoting it's usefulness in a beef animal's diet. However, the use of 'brewers wash' has a long history in cattle feeding. Some apparently odd vegetables were as well fed, such as the mangel-wurzel mentioned below, but this is actually a variety of the common beet having a white root. And just what is treacle? Well, it's nothing but syrup, or molasses, made from sugar cane. The use of molasses became common place, and continues in use today -- though generally with a motley collection of additives, unless you can buy it directly from a local sugar mill. Molasses was once considered a good tonic of sorts for cows or oxen that had been worked hard, and it was given mixed with water to aged horses in the West Indies. Without the benefit of PhD's, research assistants, and large sums of money -- many experiments in feeding were conducted, and the results stated quite simply as shown below. On the feeding of potatoes, it was interesting to note elsewhere in this old book that a diet high in potatoes made the manure of the animal quite atrociously foul. For those unfamiliar with the old 'stone' measurement, one English stone generally equated to 14 lbs. I doubt a cow or bullock could eat 252 pounds of turnips in a day, so the translation of a 'stone' of turnips must surely be of lesser pounds, or the citation below of '18 stone' of turnips daily is surely an unfortunate misprint. 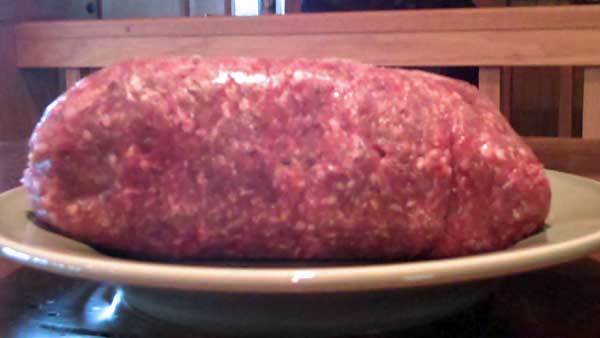 Have the use of Industrial Byproducts Changed the Taste of your Grocer's Beef? It is now 162 years since the printing of Mr. Burke's book on British Husbandry. 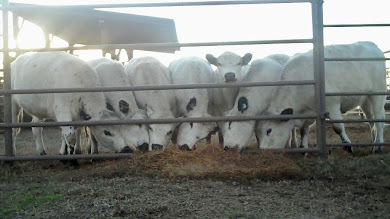 Today, the high cost of what became traditional grain products used in the supplementation of beef cattle; such as corn, oats, and cottonseed byproducts, has resulted in cattle feeders exploring other industrial byproducts that are cheaper to use for fattening. How this is impacting the taste and texture of the average pound of beef on the grocery store shelf -- I just don't know. I eat grass fed and fattened beef, and I like to add a bit of oats and molasses at the end, much like Mr. Burke mentions the addition of a little barley or bean meal towards the end of the finishing. Despite all the money spent to research, compare, denigrate, and deny the uniqueness and superiority of grass fed beef; the simple 162 year old statement of Mr. Burke's in regard to the "succulence and flavour" of grass fed beef is worth more than the last 10 years of heated debate and research on the subject.